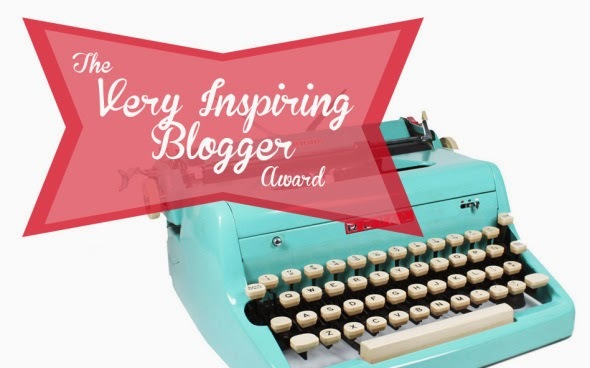 Hello again gorgeous people of the blogosphere. 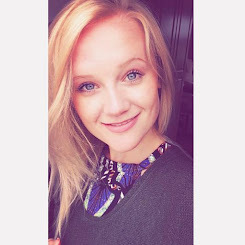 Here I am again, writing to you whilst shoved up against the radiator because I am dying of coldnessssssss... What else is a better cure for the winter blues (other than going on a luxurious holiday) than to share some tried and tested favourite sweet treats for us Gluten and Diary free peeps. At this time of year, especially, I crave that little sweet treat after dinner or as an afternoon munch with a cuppa. A lot of these end up being Vegan as well so that's an added bonus for all you egg avoiders too! I have to start with this bad boy because I found it in Tesco this week as a new product for £2.30 and oh my did I fell in lorrrrve. 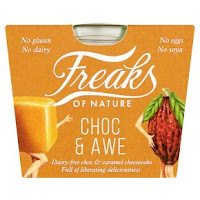 Freaks of Nature do a whole range of little puds inc Mandofandango, Cocoaloco and my new fave Choc & Awe! This little wonder of a 'cheesecake' is a dairy free chocolate & caramel cheesecake with a gluten free oat base. Trust me... it's DIVINE. If you eat raw as well, this one is for you as Freaks only use completely raw ingredients. They are miracle workers. Yeah, £2.30 is a little costly for just one pud BUT these a quality puddings that are actually rather healthy and they do other flavours at the mo in Tesco for £1.80 a pop! NEXT UP are these little pots of utter joy. 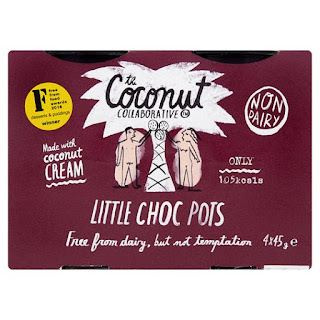 The Coconut Collaborative's 'Little Chocolate Pots' are honestly a fridge staple of mine. You get 4 in a pack at usually £2 however are often on offer in Tesco for £1.50 - basically less than 50p per pot... I mean YAAAS. These are SO delicious and don't taste like they are good for you but they actually are. WIN. If you, for some bizarre reason, needed another reason to try these then they are only 105 calories per pot... You. Are. Welcome. Next to join our taste-bud tingling line up is... 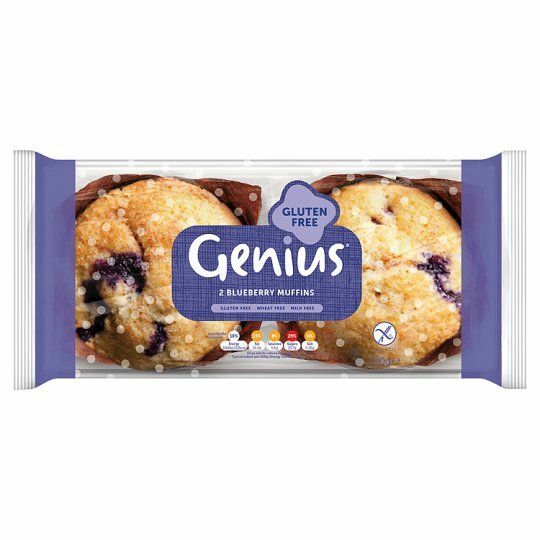 Genius' Blueberry Muffins! Now, before I knew I was Gluten Intolerant I would quite often enjoy a Blueberry Muffin from Costa (in the days that they were milk free) and then the dreaded diagnosis came and my Blueberry dreams were dashed. HOWEVER, one day my boyfriend brought home these bad boys. As appreciative as I was, inside myself I was eye rolling at the thought of a dry, un-glutenous, lacklustre muffin that I would be putting into my body. Lo and BEHOLD they are more flipping moist then the 'real' thing... I am a Blueberry Muffin REVERT. Although my conscience would never allow me to eat one of these for breakfast, I would/ and DO enjoy one of these on the odd movie night ;) You can pick these up for £2 as well. Yup, also milk free. I don't know whether I've got some pals out there who also do this but I will happily accept and welcome cereal for pudding. You feel me?! These next two products are my go to faves. Up first we have a relatively new release by the gorgeous Deliciously Ella. I have unashamedly tried all of her products and have all of her cookbooks too. Big fan, big fan. 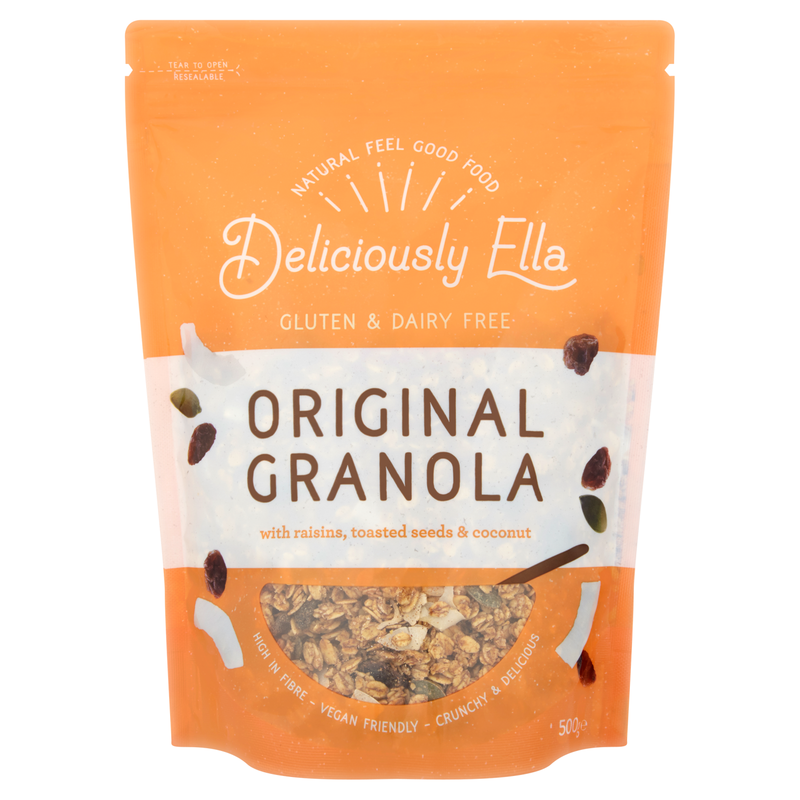 Her new Granolas are so delicious, nutritious and guilt-free as they are completely natural. 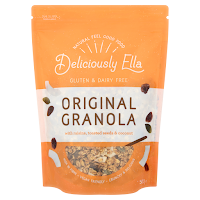 My favourite of the two is the Original Granola (also available is the Nutty Granola) as it has slightly more of a sweet kick. This is currently on the shelves for £3.99 is Tesco and Boots. Super yum. 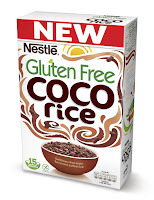 Next on my cereal LOVE list is Nestle's Gluten Free Coco Rice. This big ol' box of the childhood favourite is genuinely a go to pud for me. 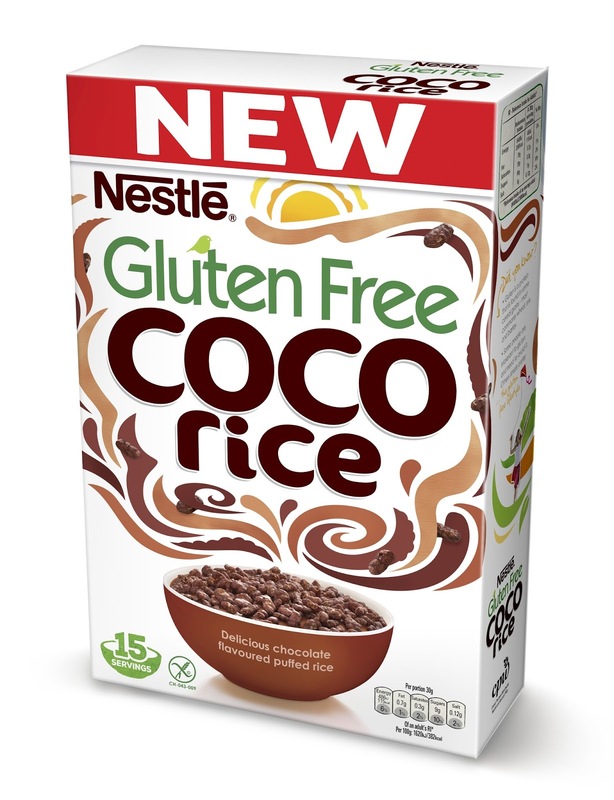 This cereal got me through a whole series of Bake Off... Made with MUCH better-for-you ingredients than the normal Coco Pops, this gorgeous stuff retails at about £2.40 in most big food stores. Tis a little bit too sugary for me for breakfast, hence my pudding suggestion. There is a rather large and ever-growing market for coconut yogurt and other yogurt alternatives these days. Trust me, I have forked out the dosh and tried every single bloomin' one going and I can safely say KoKo Dairy Free is my fave. Not only does it beat all the other brands on price, it's just as delicious and keeps for a while too. 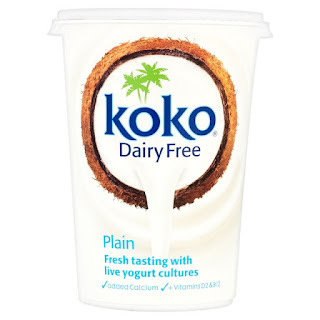 For just £2 for a big tub this lasts me all week and is a perfect snack to have with fruit (I love topping it with mango and crushed Walnuts if I'm feeling mad fancy). It's also naturally quite sweet so I don't often add any honey or anything. I'm a big chocolate fan, but as a gal allergic to cow's milk my Cadbury dreams go unfulfilled... However, a few years ago my lovely Mum discovered a company called Billy Goats Stuff. These guys are GENIUSES and have saved my mum, sister and me countless Easter's of miserableness. In a non-contaminated-nut-shell, this family run business creates countless chocolate products all made with Goat's Milk which are all Nut, Soya, Egg, Gluten, Cow's Milk and additive FREE. For all you lactose intolerants and chocolate lovers out there I cannot recommend this company enough. Check these guys out here. Lastly, I just want to quickly chat about how gosh darn hard it is eating out as a Gluten and Diary intolerant food lover... It is a sad sad process sometimes. However, having said this, in the past years I have seen a huge shift in how seriously restaurants are starting to take intolerances and allergies and are becoming much more aware of how to make their customers feel informed and safe to eat with them. Many a time I have had to sternly say to a waiter "I really need you to take this seriously because right now it feels like you aren't." Sometimes people just aren't aware of how ill it can really make you and see it as a 'fad'. Two chains I HIGHLY recommend for us allergic ones are Zizzi and Pho. Both of these chains offer extensive allergen information online and in branch and produce delicious gluten and diary free choices which make you feel like you aren't having to miss out at all. They are leading the way at the moment and I really hope the rest of the restaurant industry take note! Really hope you've gained some food inspo through this post even if you don't suffer from any allergies! It's great to try new foods to get rid of the stigma against GF and DF foods. Also for my fellow intolerant brozzz & sisterzzzz out there this has been of some use to you lovely people.